A review by Bullet. Click on the photos for a larger and better view. 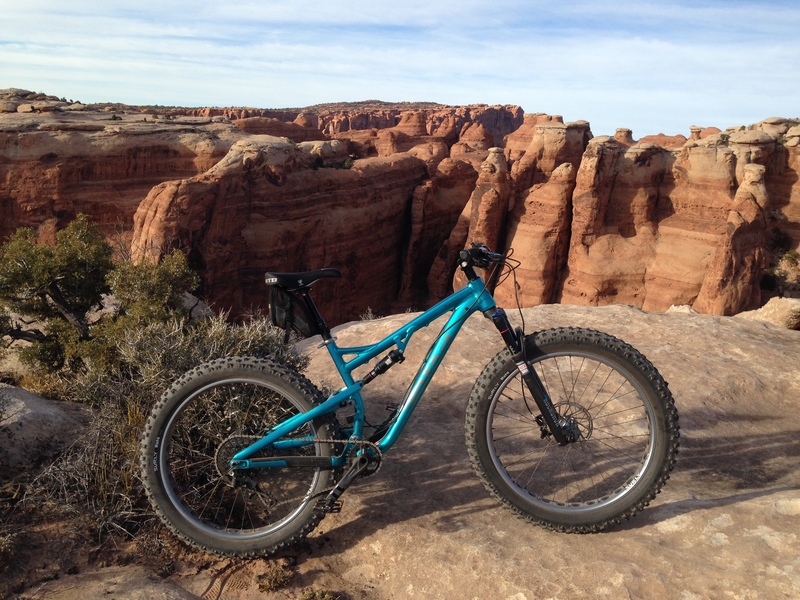 We had planned a trip to Moab for a couple days of trail riding which conveniently coincided with the arrival of the new Salsa Bucksaw 1 at Mad Dog Cycles in Orem, Utah. To say I was excited to give one a test would be an understatement at best. 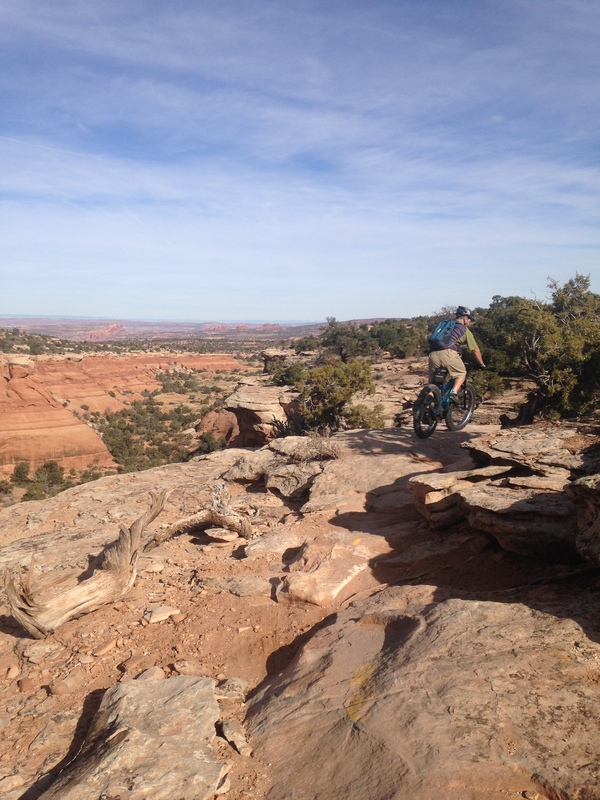 Randy, the owner of Mad Dog, was more than willing to send one to Moab with us for testing and evaluation. As is our norm, we brought the GoPro to shoot video for a trailside review as well. I have to admit up front, this bike completely blew me away. In my trailside video review you will see that I stumble over my words like a Jr High boy trying to talk to a pretty girl for the first time. It is always disappointing when manufacturers release a product before it has had all the bugs worked out of the design. However it is somewhat expected to find a shortcoming or two in a product when a first of its kind is released, especially a product with a lot of moving parts, gears and such. In fact there are many people who will not buy a first generation product because of this. I don’t believe the Bucksaw has this problem. When the first rumblings of suspension for fatbikes were being aired many of us scoffed at the idea. “Why do we need suspension with these fat tires?” Sound familiar? Then we saw the Bluto and that was pretty cool. But Salsa did not stop there. They spent three years testing and developing the Bucksaw because they wanted more and were willing to risk more by producing the first full suspension fatbike. Many of the new fatbikes coming out are from manufacturers capitalizing on what they see as a novelty or fad. The result is low end consumer priced machines. Salsa, on the other hand, is maintaining their stance in the fatbike arena as a leader pushing the envelope and developing superior technology. Lets get down to details and talk about the frame. 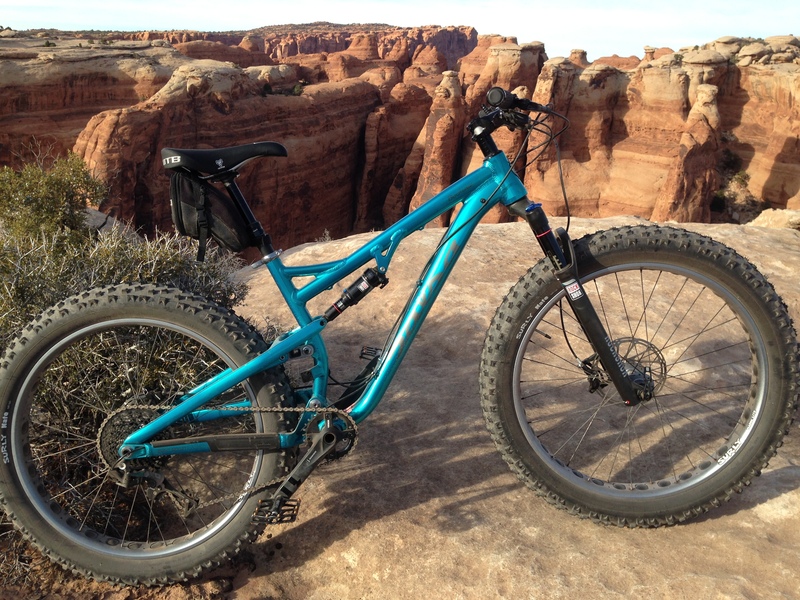 This is what gives the Bucksaw life and separates it from just another fatbike. We weighed a medium Bucksaw 1 at Mad Dog and it came in at 34 lbs on the nose. Impressive when you consider all that suspension and rear linkage. Most of the frame is constructed of AL6066 aluminum. I say most because the seat stays on the Split Pivot rear triangle are carbon fiber. This shaves some weight and perhaps provides some stiffness to the rear end. It is important to note that the Bucksaw was developed from the ground up as a fatbike keeping in mind the dynamics of running a low pressure, high volume tire. Salsa did not simply fatten up one of their existing full suspension mountain bikes and call it good. This is very evident when you ride it. I have put some miles in on standard full suspension mountain bikes and the ride of the Bucksaw is uniquely it’s own. 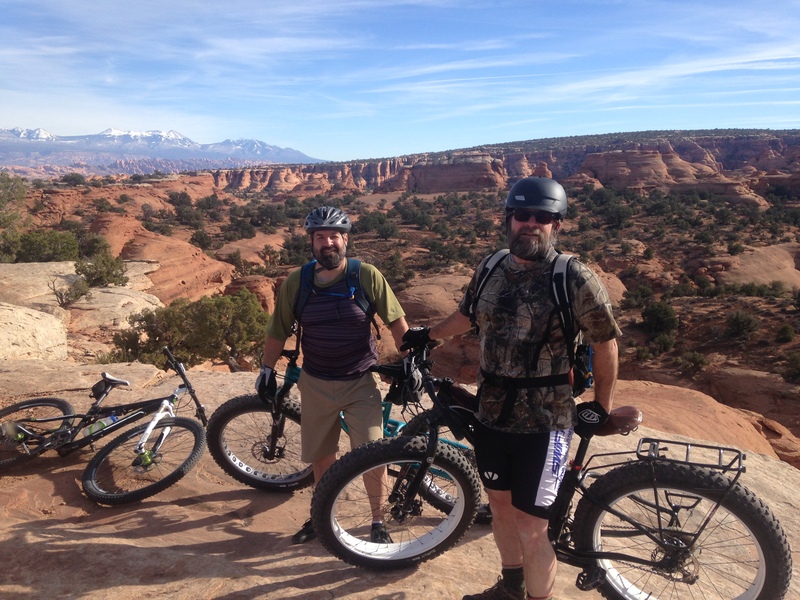 After several of us had ridden it through some rough and rocky terrain in Moab, we were trying to describe the ride. The closes thing we could come up with was it is like riding your couch. Sounds weird. I know. But the ride is so plush and comfortable that was the best we could come up with. The 100mm of travel in the front and rear Rock Shox combined with the shock absorption you get from the tires lets you steamroll some pretty rough trail without getting thrown off your game. 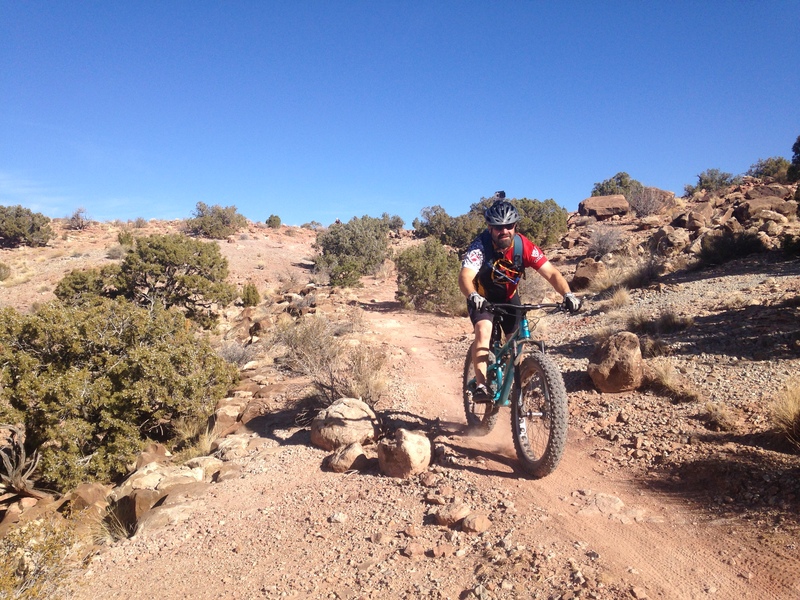 Trail conditions in Moab can be extreme to say the least. The Bucksaw tamed the worst of it and was pure pleasure to ride. One of the most impressive things about the Bucksaw is how it handled when out of the saddle climbing or just pounding the pedals in a run. I never felt like the rear shock moved until it was hitting the bumps. I never got that power sucking suspension sag as I was pedaling, and I tried to. Just one more impressive design feature. The wheels are made up of Salsa Fat Conversion hubs, drilled out Surly Marge Lite rims, and 120 TPI Surly Nate tires. The 150mm front axle combined with the tapered head tube made for very fast and responsive handling. No flexing or push felt in the way the bike handled. The narrower Marge Lite rims gave the Nates a rounded profile that helped the Bucksaw flow through the corners. This bike was built for trail riding rather than snow specific conditions so the typical fat and flat tire profile would not have performed nearly as well. The Nates did a good job but they would not have been my first choice of tire for the Bucksaw and here is why. The Nate is a fantastic tire for snow and other sloppy conditions. 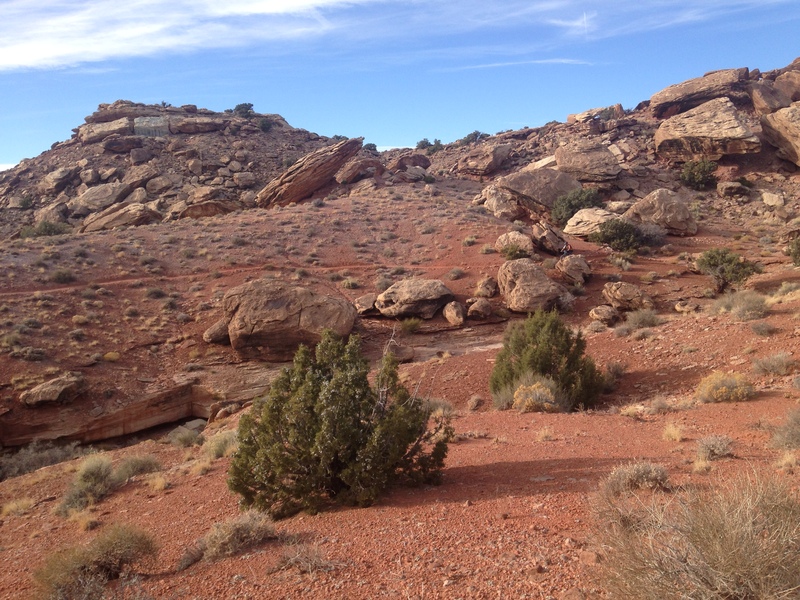 It performed well in the sand especially in Moab and did fine on the hardpack and slick rock. The only thing I don’t like about the Nate is on hardpack you get a lot of rolling resistance. You can feel the tread bumping along the trail. 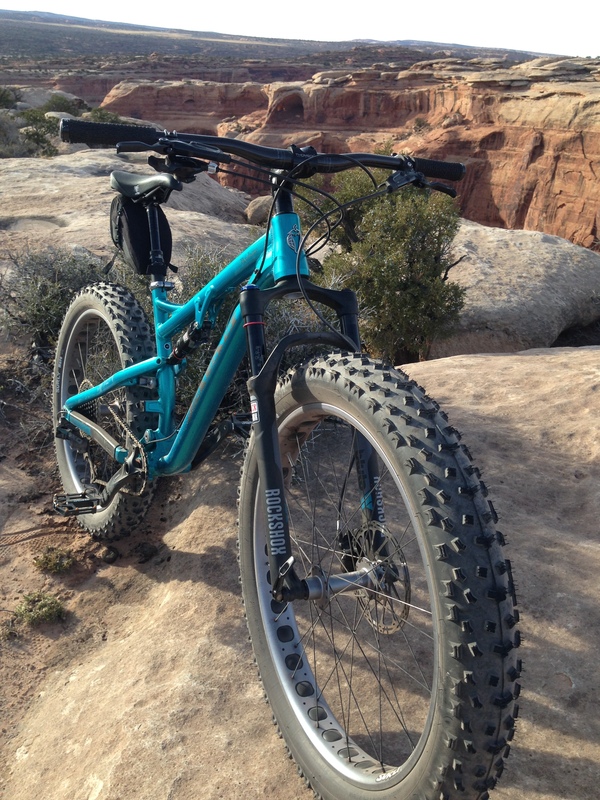 Not a huge drawback but if I had to choose from the Surly lineup of tires I would have gone with a Knard. It is a faster tire for trail riding without giving up anything the Nate has unless you are riding in the snow or mud. The drivetrain had me a little worried to be honest. I had never ridden a 1×11 before. I will readily admit that I am not the strongest climber out there and really like my gears. Especially the great big ones in the back and the little one in the front. Well as it turns out that is exactly what the Sram X01 drivetrain has. 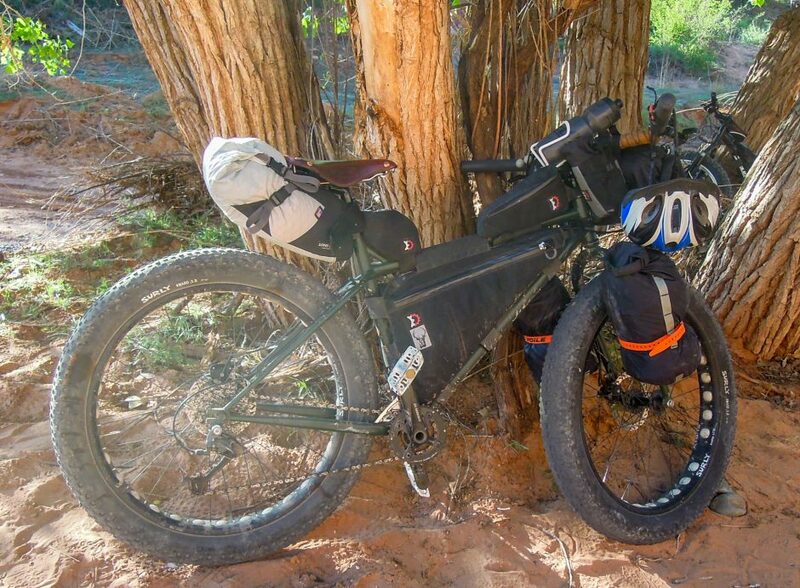 There were a few times during the two days we were testing the Bucksaw that I could have used a bigger granny gear but that’s the story of my life on a bike. For a trail bike like this I think a 1×11 is the way to go. The Sram Guide RS brakes were everything they should be. Rock solid stopping power when you wanted it. They worked flawlessly to the point that I really never even thought about them during our 40 miles of test riding. And when it comes down to it, isn’t that really what we want, components that we don’t have to think about so we can just ride and enjoy? The Bucksaw 1 is also equipped with a Rock Shox Reverb Stealth dropper post. A lot of people I ride with have been telling me once I try it I’ll never want to ride without one again. So this was my first experience with one. It functioned smoothly just as it should. 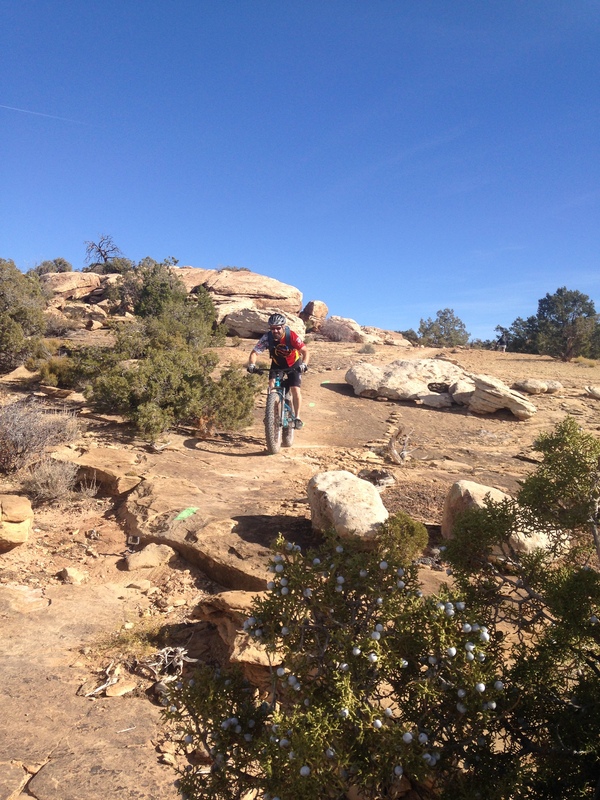 I found it convenient to have the seat out of my way while picking my way through some rough descents. Then with the push of a button the seat was right back where I needed it. Cool. I see the merits there. I may not be running out to buy one for myself right away but it is a nice feature and does add value to the Bucksaw 1. Another thing Salsa does better than most is their paint. It may seem trivial to some but I appreciate a quality paint job on a bike. Even if I am going to do my best to remove it through various acts of self proclaimed bravery and undeniable stupidity. When you’re spending top dollar on a machine like this it is nice to know the manufacturer is proud enough of their work to put some money into the cosmetics and Salsa did not disappoint here. There are a lot of other nice details Salsa has built into their new Bucksaw line. Rather than boring you with a list of features and specs I’ll put a link here so you can look at them side by side and see what Salsa is offering. So what’s the bottom line? You can have your own Bucksaw 1 for the suggested retail price of $4999 or the Bucksaw 2 for $3999. Salsa may be pushing the envelope in fatbike technology as well as price range but guess what, when you have the “first one” and it’s not just a homerun but a grand slam, you get to pick your price and people will pay it. Why? Because, at least in this case, it is worth every penny. And here is a video review with some footage of the bike in action. Reblogged this on Slam69 Blog.